Searching for an updated condo with awesome views? This is a MUST SEE! Wide ranging views of our intracoastal waterway, Madeira Beach, & sunsets on the Gulf of Mexico. Complete recent renovation ($80K). I mean everything! From the wall & ceiling texture, then paint, crown molding, electrical fixtures, switches, & designer lighting. New kitchen with tray ceiling, custom soft close cabinets, breakfast bar island, granite countertops, & stainless appliances. Completely new bathrooms with stone top vanities and walk in shower. Porcelain wood plank tile throughout. A/C 12/2017. 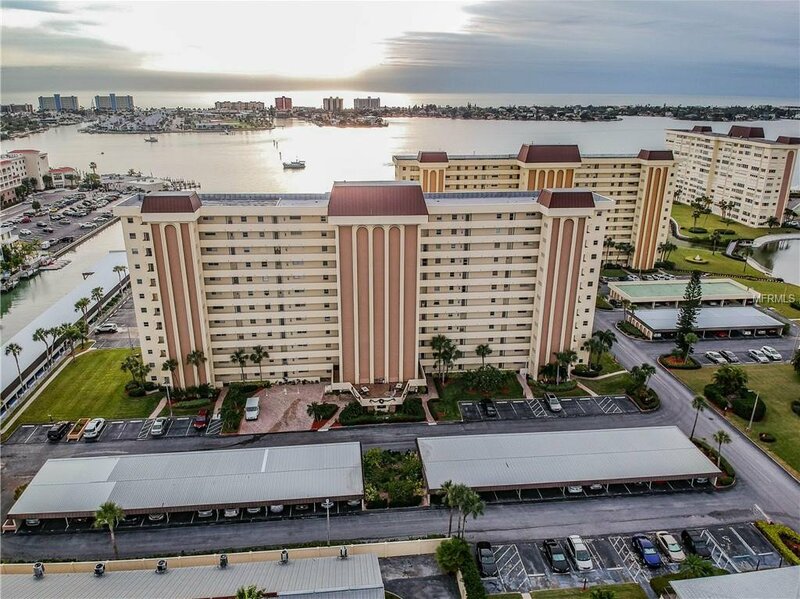 This 1 bed, 1 & half bath condo also features the larger Florida room(10x10) which can accommodate a queen size bed for guests plus a queen sofa sleeper in the living area so you literally could sleep 6 if needed. In essence, it’s a brand new condo from the walls in. Sea Towers is a wonderful 55+ community with activities for all. Gated with 24/7 security, 2 heated pools, tennis courts, shuffleboard, putting green, fishing docks & covered picnic shelters. Recreation building/clubhouse with social director. Work out room, sauna, exercise classes, billiards, library, card games, shows & dinners. Covered boat slips & kayak racks for rent. Walking distance to shopping center, grocery store, restaurants, banking & our waterfront American Legion. Enjoy a walk around the grounds featuring a lagoon, fountains, tropical landscaping & waterfront pier. Doesn’t get any better. Make sure you schedule to see it soon or you may be too late. Listing courtesy of CHARLES RUTENBERG REALTY INC. Selling Office: CHARLES RUTENBERG REALTY INC.